Exciting things are happening in Toronto’s street food scene, with over 300 licensed food trucks serving everything from cupcakes to brisket in downtown parking lots. 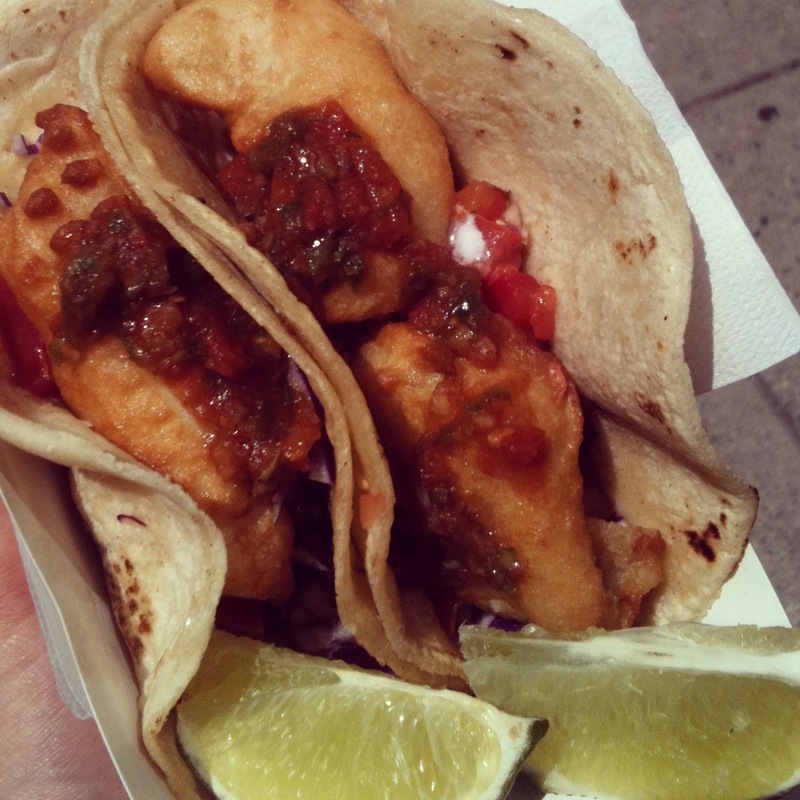 My colleagues frequent the food trucks at Jarvis and Queen Street East and rave about smoked meat sandwiches from Caplansky’s and gourmet fish tacos from Buster’s Sea Cove, a St. Lawrence Market staple since 1992. I had yet to venture to the Land o’ Food Carts and felt I was missing out on my city’s unique culinary offerings. So, last week I decided I had lived too long without experiencing lunch from a mobile kitchen. The fish tacos were what I truly wanted, but the first time I visited the lot, Buster’s Sea Cove wasn’t there. Gone fishin’ or something. Instead, I ordered a chicken gyro with french fries in it (!) from the Blue Donkey Streatery. 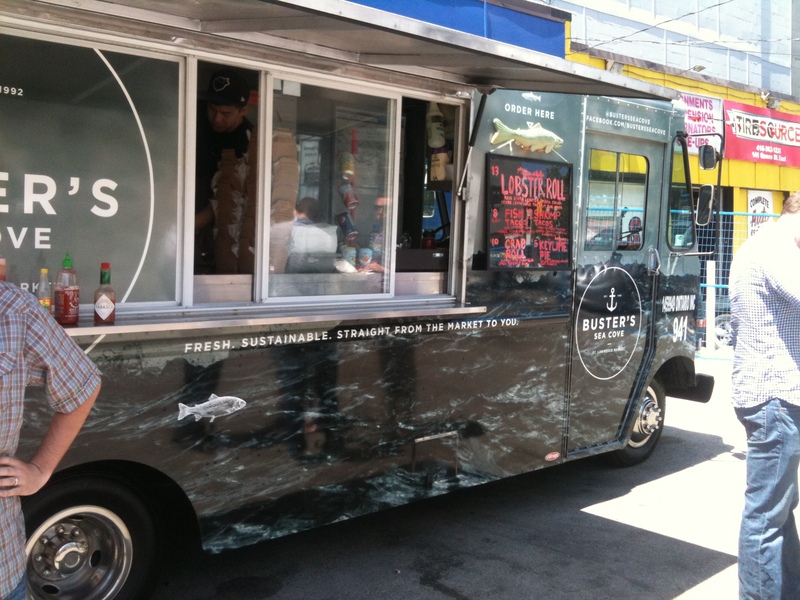 I was determined in my quest to try Buster’s fish tacos, which had now become the holy grail of curbside eats. A few days later, I trekked back to the parking lot and was pleased to see Buster’s anchored there. (Forgive the cheesy puns?) I sailed up to the window and placed my order for fish tacos (you can also get shrimp tacos; I’ll try those next time). For eight bucks, you get two tacos, which equals three to four pieces of hand-battered fish topped with sour cream, tomatoes, pico de gallo and lime wedges. My coworkers weren’t kidding: the tacos were quite a catch. Mmmmm… when’s lunch?! You can find a daily listing of the carts’ locations at Toronto Food Trucks. This entry was posted in Food and tagged blue donkey streatery, buster's sea cove, buster's sea cove food truck, caplansky's, caplansky's food truck, fish tacos, food, food trucks, gourmet fish, restaurants, toronto, toronto food carts, toronto food trucks, toronto street food, two tacos by lovewritenow. Bookmark the permalink. I haven’t, I’ll have to give them a try. Thanks for the recommendation!